This might be news to some of you, or perhaps not - but I am currently in the process of writing a book of patterns that will see the light of day in early 2013. It will be published in both print and digital form on Shannon Okey's fantastic Cooperative Press imprint. I am more excited about this than I can really say, and not just because big parcels of tasty yarn keep turning on my doorstep. But if I eat it, what shall I knit my samples with? It's a problem. I have opted to take the (possibly crazy) approach of Being My Own Test Knitter so now the fun begins - knitting all those samples myself. Some of you Nice People have told me, begged me, pleaded with me to outsource this work to ready and willing test knitters; to give me more time for the writing and for the myriad other projects I have on the go. As inviting as those idle hours sound, I still have to refuse. 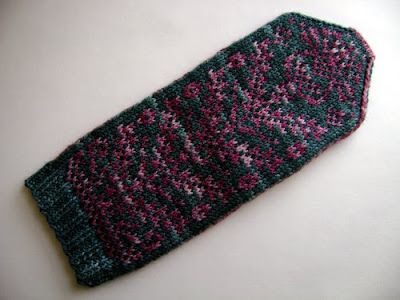 For me, the knitting of the sample is vital to the ultimate design of the finished product. I have to get my hands on the thing - properly dig in to it - to see what works and what doesn't. 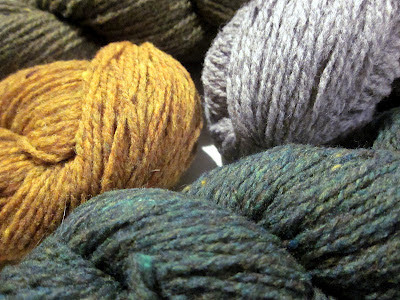 Plus, part of me would feel fairly awful about shifting what I see as MY share of work into the hands of otherwise unencumbered knitters who I'm sure would much rather knit projects of their own choosing. So you know what that means - that I have an inordinate amount of knitting ahead of me, on top of all the knitting that I have to do for other worky things; on top of all the knitting that I want to do for the upcoming holiday season; on top of all the knitting that I want to do for myself. For a while now (oh, what, about a year?) I have lived in fear of this daunting amount of knitterly work (well, it is and it isn't,) believe me when I say that I am overjoyed to announce that I have Officially Begun Knitting For The Book! This is huge news for me - and possibly for you - as The Book is officially, for really-real, extra-tasty-crispy going to happen. The worst part? That I am madly and deeply in love with these patterns and I can not show them/share them with you - yet. We will all have to be strong - and patient! - until the end. 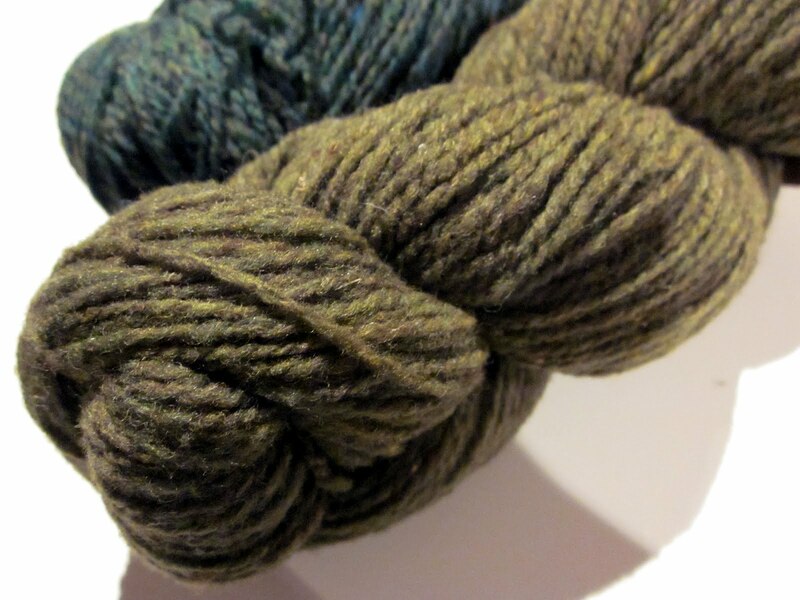 In the interim, however, I do plan to entertain you with pretty pictures of delicious yarn. It will have to do. But! I do have a wee something for you - right now - that may perhaps sweeten this arrangement. I don't know if you remember my Prickly Thistle Mittens? 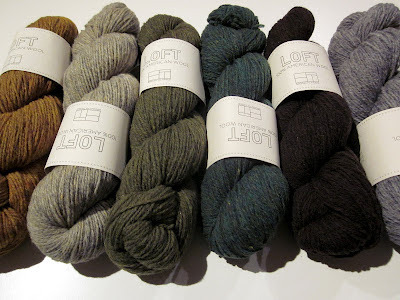 They were originally designed for MacKintosh Yarns way back in 2009. The pattern was - and still is - for sale at MacKintosh Yarns but is now also available directly from me on Ravelry. 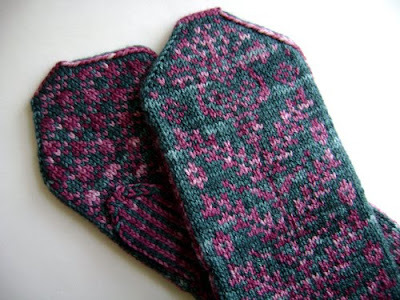 I love these mittens deeply, and I stand by statement that they might be one of the prettiest things that I've ever knit. So that's sort of like getting a new mitten pattern, now, isn't it? I do hope it tides you over until I have something more to share. As for me, I am itching to knit these mittens in an alternate more sheepy colourway. but I have this pile of work-knitting in front of me...here goes nothing. Oh, boy! I can hardly wait! 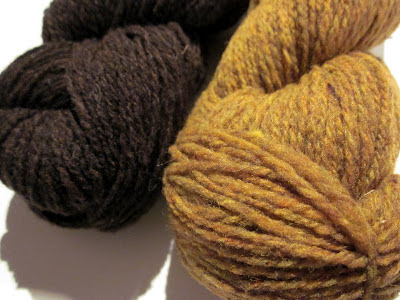 August 9, 2012 at 8:06 p.m.
Sending all good knitting karma your way. You will do it. It will be good. August 10, 2012 at 2:14 a.m.
YAY! Looking forwrad to it! August 10, 2012 at 8:20 a.m.
That is great news! So exiting! I can't wait to see your patterns! September 28, 2012 at 3:28 p.m.
Will you please post a link to your Blog at The Knitting Community? Our members will love it. Members include: knitters, knitting enthusiasts, experts, groups, circles, organizations, etc. It's easy to do, just cut and paste the link and it automatically links back to your website. You can also add Photos, Videos and Classifieds if you like. I hope you consider sharing with us. November 19, 2012 at 11:24 a.m.